The Orbital ATK Cygnus spacecraft was pictured Feb. 19, 2016, grappled by the Canadarm2 after being unberthed from the Unity module Earth-facing port. 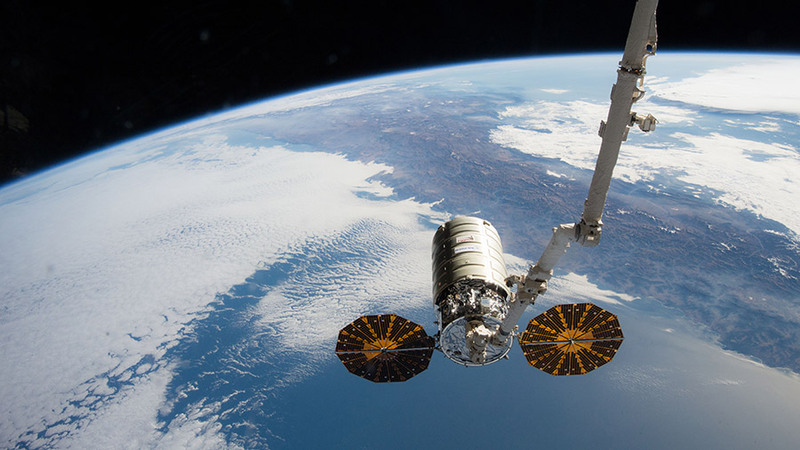 An Orbital ATK Cygnus spacecraft carrying more than 7,600 pounds of supplies, science and research investigations is set to arrive to the International Space Station early Saturday morning. The uncrewed cargo ship launched at 11:11 a.m. EDT on Tuesday, April 18 on a United Launch Alliance Atlas V rocket from Cape Canaveral Air Force Station in Florida to begin its four-day journey to the orbiting laboratory. Expedition 51 Flight Engineer Thomas Pesquet of ESA (European Space Agency) will use the station’s robotic Canadarm2 to capture Cygnus at approximately 6:05 a.m. on Saturday, April 22. NASA Television coverage will begin at 4:30 a.m. Installation coverage will resume at 7:30 a.m.
Coverage will air live on NASA Television and stream on the agency’s website at: www.nasa.gov/live. The mission is Orbital ATK’s seventh contracted commercial resupply services (CRS) mission, and its third launch atop an Atlas V rocket from Florida. Future missions under Orbital ATK’s CRS-1 contract with NASA are expected to resume from the agency’s Wallops Flight Facility in Virginia.